Have you been wrongfully injured on an oil field, on a job site, or in an accident involving an 18-wheeler truck? It is important that you contact a North Dakota big rig and oil rig attorney from Lenahan Law Firm right away. We have experience handling a variety of complex injury cases and we may be able to help you as well. Of course, no two cases are ever the same, and we cannot promise specific results, but we can work hard to develop a personalized legal strategy for your situation. If you have been injured, we encourage you to look through some of our answers to frequently asked questions regarding injury cases and contact a North Dakota big rig and oil rig lawyer from our team for further assistance with your case. When can I receive compensation? After an accident, you may be feeling financially strapped, and receiving compensation for your injury is probably one of your top priorities. The sooner you retain the representation of Lenahan Law Firm, the sooner we can begin to develop a personalized strategy for your case and aggressively pursue the highest amount of compensation available for your situation. Do not hesitate to contact our team right away! I am aware of an unsafe situation at my job site. What can I do? The Occupational Safety and Health Administration (OSHA) governs work safety and enforces various laws governing training, welfare, security, and whistleblower status for employees in the United States. If you are aware of an unsafe situation at work, you can report it to OSHA. It is important that you speak with an attorney from Lenahan Law Firm first to safeguard your rights and interests. Is my case worth anything? There are a number of variables that need to be taken into consideration when determining the amount of compensation that you may be eligible to receive. Our firm can help determine the severity of your injuries, prove who is liable for the injuries, and convey the amount of pain and suffering that you are going through in order to establish the potential value of your case. We can review your medical expenses and out-of-pocket expenses as well and pursue a claim to compensate for these losses. As with any legal situation, there is a possibility that you will have to go to court if you file a claim; however, almost all personal injury and civil cases are settled out of court. When you work with our firm, we can push for the highest amount of monetary compensation available inside or outside of a courtroom. Our attorneys have the skills to litigate a case at trial or settle it without setting foot in a courtroom. Each case is different, and the specific factors of your case can play a role in how long it will take to resolve the case. Most claims are settled within a few months to a little over a year. Some cases can last longer, but each situation is different, and your case will vary. To get a better idea of how long your case may last, it is important that you speak with an attorney regarding your situation. Yes! You should never pursue compensation or a proceeding in the North Dakota justice system alone! The laws and regulations governing injuries and liability can be difficult to understand, and without the representation of an attorney, you may be facing an uphill battle and you could make a mistake that would be detrimental to your case. In order to protect yourself and your rights, it is vital that you speak with a member from our team. What are my rights after an accident? After an accident, especially one that was caused by another person's reckless, illegal, or wrongful behavior, you have the right to pursue compensation. Additionally, you have the right to work with an attorney before speaking with insurance companies, and it is important that you contact our firm right away. The attorney you hire as your representative can make all the difference in the outcome of your case. Our firm is different from other firms in the area - we approach each client's case as a unique situation that deserves personalized representation. If you are injured and are unable to get to our firm, we may even be able to come to you. We are proud to offer free case evaluations to all potential clients, allowing injured individuals the opportunity to speak directly with the lawyer who can represent them. 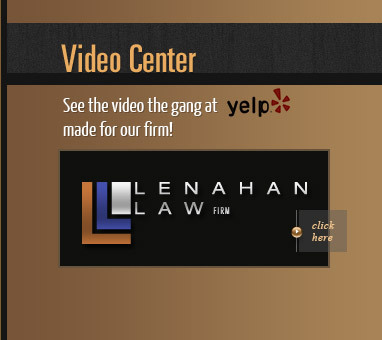 If you have any questions or concerns regarding your situation or how a North Dakota big rig and oil rig representative from our team can help, do not hesitate to contact Lenahan Law Firm right away!